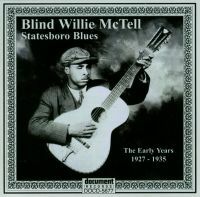 Blind Willie McTell was distinguished by his clear voice and the technique he employed to play his 12 string guitar. His guitar lines were crisp and clean which complimented his lyric delivery. McTell was able to cater for any audience with his repertoire, which included blues, ragtime, gospel, pop and country tracks. Although none of his records was a hit, he had a prolific recording career, due to the fact that he used different names each time he met a record company scout. Little was known about his life until blues enthusiast David Evans (who also wrote the CD notes for this Document release) interviewed Kate McTell in 1977 for Blues Unlimited magazine, thus ensuring details of Blind Willie`s life and recording dates were made available for future generations. Blind Wille McTell left behind a durable body of work that has been appreciated by many blues and rock fans; his song "Statesboro Blues" was exposed to millions via cover versions by Taj Mahal and the Allman Brothers Band. Blues lovers who crave the early recordings of Blind Willie McTell need look no further than the digitally re-mastered Document Records 3 Disc Box set, with informative booklet notes written by David Evans, full discographical details and new cover art. Disc 1 comprises of the sessions he recorded for Victor, Columbia and OKeh from 1927 to 1931. Disc 2 takes in the sessions he recorded for OKeh, Columbia, Victor, ARC and Vocalion from 1931 to 1933. Disc 3 covers the sessions he recorded for Vocalion and Decca from 1933 to 1935.